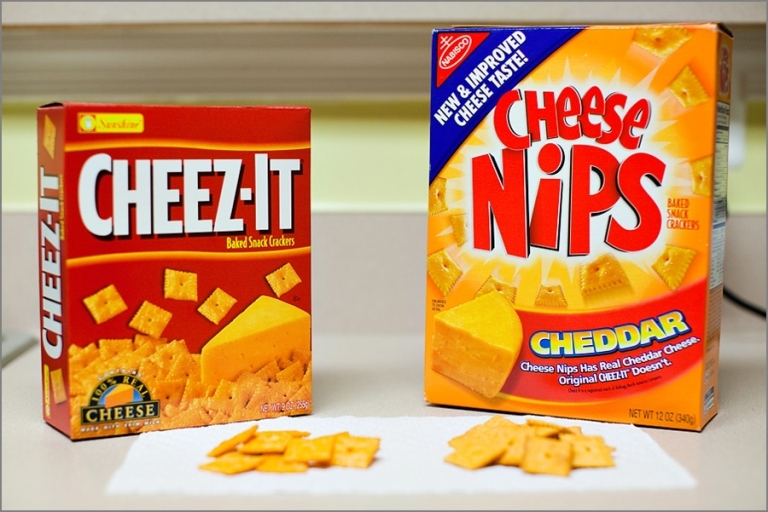 And as a completely random bit of fun, Chris and I were grocery shopping last weekend and were suddenly curious about the difference between Cheese Nips and Cheese-Its, and we decided to do a taste test comparison. I mean, how can they have two crackers on the market that look exactly the same? Yes, things are that exciting around here on Sundays! Neither of us eat either brand of cheese crackers on a regular basis, so we feel that our test was unbiased and fair. We determined that the Cheese Nips seem to have more cheese flavor, and are lighter in texture. They’re 2 grams of fat less per serving, but have considerably more sodium than Cheese-Its. The conclusive results: we probably won’t buy either cracker again because Chris doesn’t really eat crackers, and I am more of a Goldfish kind of girl. Do you have a preference? 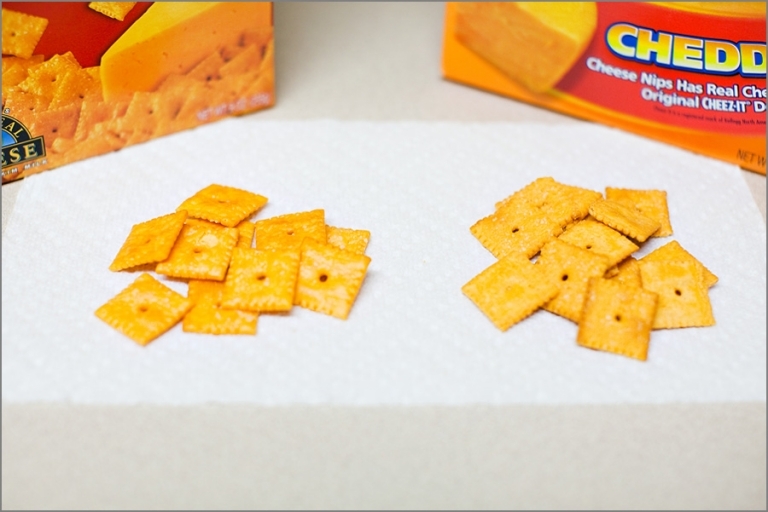 Weigh-in on the cheese cracker debate! As a side note, sometimes I ask Chris about things that I am about to post on my blog. I said, “Is the cracker thing stupid or funny?” and he declared it was funny, so blame him if this is just too far out there for you! Don’t worry, I have Coelle and Corey’s engagement photos coming up this weekend, so we will return to your regularly scheduled photo blog shortly. Eileen Broderick - This is totally random and off the wall. So of course it is something I have thought about and have an opinion on! I feel rather strongly that Cheez-Its are better. But maybe I am biased? My Mom only bought Cheese Nips growing up. And I think she served them to us stale all the time. And I was too young to know better or to defend myself. So perhaps that is at the root of my feelings. But when I got older and finally tasted Cheez-Its it was like the veil was lifted. A proper square cheese cracker, at last.